Preheat the oven according to the cake mix directions for a glass pan. Mix up the batter using the directions too. Arrange the half-pint jelly jars on a baking sheet. Divide the batter evenly among the jars. Bake the jars of batter for 20-30 minutes, until a cake tester inserted in the center comes out clean. Remove from the oven and let cool. Cover the jars, as desired and store until ready to use. When it's time to serve 'em, uncover the jars and frost with the Whipped Cream Frosting. Sprinkle with mini chocolate chips and stick a graham rectangle in the side of the jar. Have you seen the adorable, portable, super easy cakes that are all the rage these days? So called cakes in a jar are single-serving sized mini-cakes baked in jelly jars. That means you can totally screw on canning caps and take ‘em just about anywhere. Besides the obvious cuteness factor of these, I love how they are low-mess. Since they come in a sturdy serving container, you don’t run the risk of having crumbs everywhere like you do with cupcakes. Well, at least like I do. And the reusability factor of the jars is huge too. 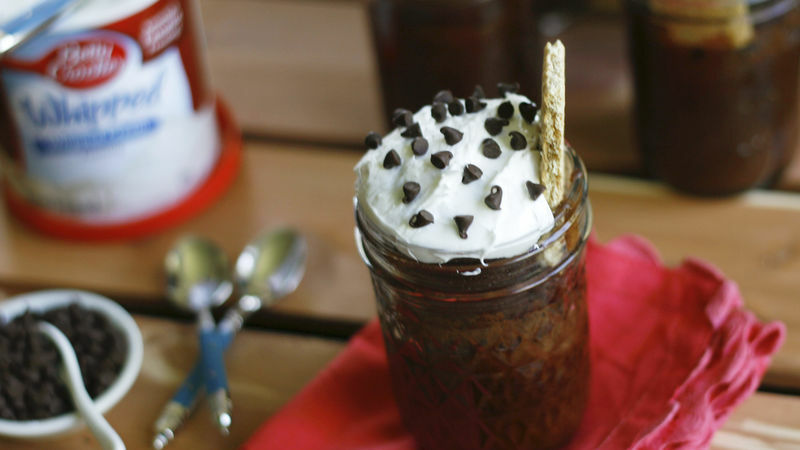 My recipe for S’mores Cake in a Jar is a fabulous introduction to cakes in jars. It takes the iconic flavors of s’mores (perfect for summer!) and transforms it into a cake. You start with Betty Crocker cake mix in your favorite chocolate variety (I use Devil’s Food). Then you make the batter and bake it in jars. Once they are done, you let them cool a bit and then close them up with a canning jar lid. At serving time, just have the cakes ready to go along with Betty Crocker Whipped Cream Frosting, mini chocolate chips and graham crackers. You can frost and decorate them if you want – or you can let guests in on the fun by letting them do their own decorating magic. Sarah W. Caron (aka scaron) is a food writer, editor and blogger who writes about family-friendly foods and raising a healthy family at Sarah’s Cucina Bella. She’s crazy for desserts in jars. Have you made cakes in jars? What’s your favorite?